Following the receipt of ISO 9001 certification for its patent granting process last December, the EPO has now also achieved certification for its patent information and post-grant activities. ISO 9001 certification is an internationally recognised standard for quality management systems. The process of certification requires senior management engagement, solid processes and monitoring, and staff commitment. The extended certification now means that post grant activities such as publication, register and post grant fee handling are certified to the same rigorous standards as the search, examination, and opposition stages of the patent process. 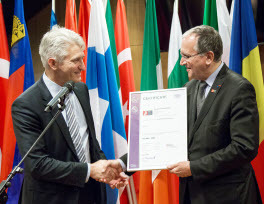 The certificate was presented to EPO President Benoît Battistelli in Munich yesterday by Götz Blechschmidt, Managing Director of the German Society for the Certification of Quality Assurance Systems (Deutsche Gesellschaft zur Zertifizierung von Managementsystemen). "The EPO's quality management system now covers the entire patent process," said Mr Battistelli. "This extended certification demonstrates our dedication to continual improvement for the benefit of patent applicants and the public. 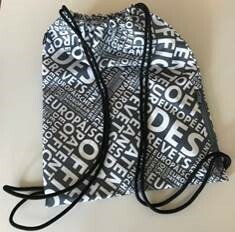 It is a ringing endorsement of the EPO's unwavering commitment to the highest quality patents and services " he added. ISO 9001 certification forms part of a robust quality policy which the EPO has put in place to ensure high quality patents and services. Results of a recent Annual Quality Review have also shown that the EPO has surpassed this year's quality objectives. The Organisation has set ambitious and achievable targets for 2016 and which now include objectives for patent information, in light of the extended ISO 9001 certification.